A city you just have to enjoy! The Washington DC Travel Guide is meant to be a place where you can go as a Washington DC Tourist, but also if you are a Local. No matter, if you are searching for a great Washington DC Vacation Guide or Washington DC Coupons (e.g. through Groupon), here is where you will find all you are looking for. Our Nation's Capital has so much to offer and with over 16 million visitors (approx. 1.2 million of them from outside of the United States), Washington DC is certainly not the most visited city in the U.S. (that's actually NYC with over 46 million annual visitors). But we have all these Washington DC Monuments, the Museums (the ones that are part of the Smithonian Institute as well as the independent museums), the Government Buildings (White House, Capitol, etc. ), the tours, the Mall and Parks around the city and so much more. Your Washington DC Travel Guide will list a lot of these attractions in Washington DC. To make it easier to find tips and valuable information in this Washington DC vacation guide, we categorized the site in many different sections. The Navigation Bar on the top shows you the categories most visited on our site. However, the navigation bar on the left gets you to even more categories with Washington DC travel tips. The table of contents below lists some of the content we have accumulated for you. This site is all about us sharing our experiences and knowledge with you and you sharing your DC travel experiences with us and other visitors to the site. Enjoy the Washington DC Travel Guide, browse around, book your travel, come back often and share with your friends. If you come here with your school, tell everyone about this extensive source of information. And don't hesitate to stay up-to-date through facebook and twitter. Welcome to our site and welcome to Washington DC! You have a long list of Washington DC Events to choose from when in the Nation's Capital. DC Insider Guide will introduce you to the most known, most visted, and most famous DC events. You will also find information about Washington DC event venues like the Verizon Center Washington DC, the Warner Theater DC, the Kennedy Center Washington DC and any other theater Washington DC as well as several other event venues in Washington DC. 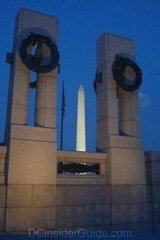 Washington DC Memorials should definitely be part of your visit to downtown DC. There are plenty of them, including the new Martin Luther King Memorial, the Franklin Delano Roosevelt Memorial, the Iwo Jima Memorial, the Jefferson Memorial Washington DC, the Korean War Veterans Memorial, and the beautiful Word War II Memorial DC. There are so many Washington DC attractions - besides all the Washington DC Museums and the memorials in DC. Just to name a few of the tourist attractions in DC, we have the National Cathedral Washington DC, the National Zoo Washington DC, the National Mall DC, Union Station and the National Archives. Opening Day for Washington Nationals Baseball is coming up soon and excitement is growing as the team gets better and better. Check out the news around the Washington Nats, Nationals Stadium, Washington Nationals Spring Training, and the Washington Nationals Opening Day.